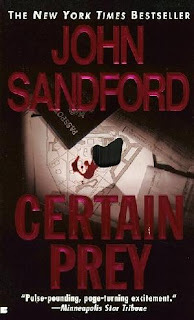 Certain Prey is an entertaining glance into some sick and twisted characters, mainly Carmel who is clearly psychotic. While readers can understand more of Clara and her background and motives as a professional killer, it's actually more evident that Carmel is the biggest, craziest monster of all. Tenured detective Lucas Davenport eventually figures out that Carmel is up to no good, and pulls out all the stops to incriminate both women -- if he can catch them. I'm a huge fan of police procedural, violent, contemporary crime novels, as well as true crime. Certain Prey is like addicting brain candy -- you'll devour it non-stop until it's over, when you realize you gained nothing in the way of knowledge but experienced hours of entertainment. The ending of Certain Prey is predictable, but the ride itself is fun and suspenseful. I am impressed by the sprinkle of humor John Sandford incorporates off and on throughout the novel, such as when he dryly describes detective Davenport arranging his fingers in a steeple at his mouth, with the thought of how he hopes he resembles Sherlock Holmes . How random, and funny! Certain Prey is the tenth novel in the Lucas Davenport "Prey" series, which is now twenty-one books deep. The author is incredibly prolific and has also written other series and stand-alone novels including The Night Crew (1997) and Dead Watch (2006). Check out John Sandford when you need a mind's rest from literature!